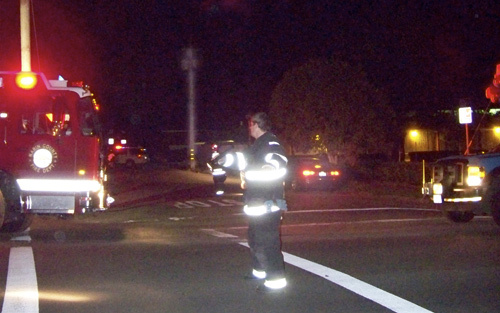 Seeing the massive emergency-worker response, one could have imagined al Qaeda had struck in Point Reyes Station Friday evening. However, if there was a suicide bombing, it was a bird-brained idea. 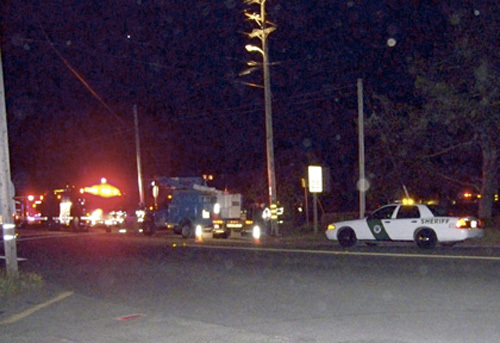 A crowd of fire engines and sheriff’s patrolcars blocked off Mesa Road behind Wells Fargo Bank after a powerline snapped at a pole behind the Palace Market’s parking lot around 8 p.m. 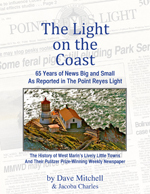 The mishap blacked out Point Reyes Station and the rest of the Tomales Bay area for roughly half an hour beginning around 9 p.m. when PG&E shut off power. It all began when a transformer blew on the pole at center. A firefighter told me that some people at the scene believe a bird flew into the transformer, but no evidence of any bird was found when Marin County firefighters arrived from two blocks away. Around town, however, the bird was being described as a turkey vulture. The blown transformer caused a powerline to burn through, with one end of the line dropping to the ground roughly 20 feet from a car parked on Mesa Road. The line burned along the ground almost to the car (seen just right of center above) but then went into a hedge behind the bank and up past a small tree. The line burned almost a cubic yard of hedge but did not start a major fire. 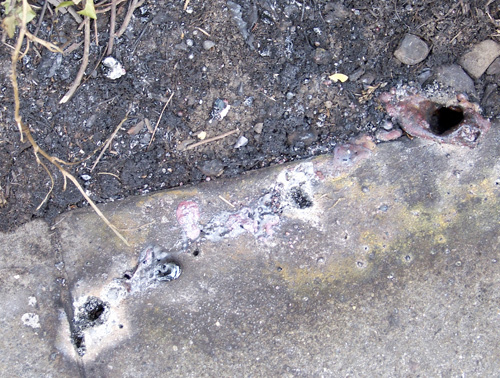 The firefighter noted no water was sprayed on the shrubbery because of the electrical risk. 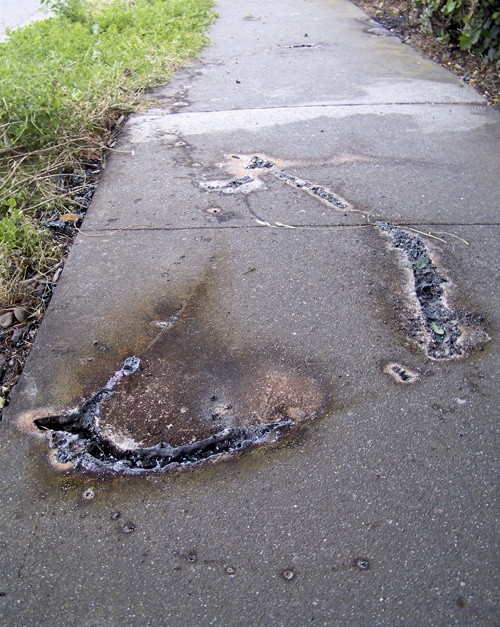 The broken powerline was so hot it not only burned a groove into the sidewalk, it melted the cement around it into obsidian-like glass. Sparsely Sage and Timely is powered by	WordPress 4.9.10 and delivered to you in 0.515 seconds using 52 queries.